This is not a cheerful poem. 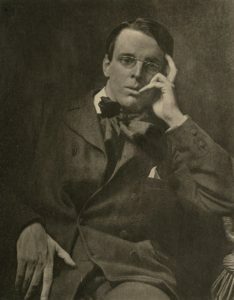 Yeats wrote in shortly after World War One, the world having witnessed what was supposed to be the war to end all wars. That didn’t hold. And the most famous line from the poem – the center cannot hold – refers to a world falling into chaos, where the extremes tear apart what should be the peaceful, sane, stable world in which most people exist. Perhaps you feel like you live in a society in which the center isn’t holding. The battle between conservative and liberal, right and left, red and blue, have lost all pretense of decorum. Both sides tear at the place where most of us live and work, threatening to topple what is good about society and replace it with certain disappointment. Why are the two sides of our political/cultural debate so far apart? Perhaps because each has an overly exalted view of itself – and an overly critical view of the other. If perception is reality, we have some horrendous perceptions to overcome. How conservatives view themselves: We are the champions of freedom and the constitution. We believe capitalism gives every person the opportunity to make the most of themselves and realize the American dream. The Bill of Rights – all of them – are essential to preserving liberty. Fundamental to all we have achieved as a society is based on the fact that we are a Christian nation. We believe in the rule of law and strong morality. Our rights are granted by Almighty God. How liberals view conservatives: They are heartless robber barons who care only about money and don’t care who they destroy to make more of it. They have no moral code, despoil the environment, enslave the masses, and pull the wings off flies. They are the uncaring elitists who take every tax break they can find and live in unfettered material luxury. How liberals view themselves: We are the people who really care about others and the world. We know what is best for society and are the ones who should decide how our human and financial resources should be allocated. The constitution is flawed because it focuses on prohibitions rather than guarantees. We must redistribute wealth according to government formulas and believe that the grantor of all rights is, in fact, the government. How conservatives view liberals: These people think they are the smartest people in the room but are really foolish, arrogant dreamers. They respect only the laws that serve their desires, ignore and constitution, and would turn the greatest nation in the history of mankind into a combination of the economy of Venezuela and the totalitarianism or North Korea. They deny God and make Orwell’s 1984 come true. …Christianity is the companion of liberty in all its conflicts-the cradle of its infancy, and the divine source of its claims. 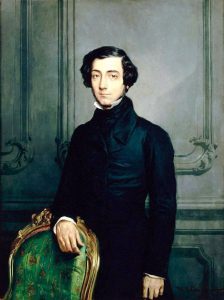 Yes, De Tocqueville made his observations a long time ago and much has changed. The poor man had to travel and country without a car, smartphone or cable news. He simply observed and reported. And what he observed was a remarkable nation built on a foundation of faith. That’s right: simple but profound and idealistic Christian faith. That faith was at the center and was the center. Everything else depended on it. Today, we are a culture torn between left and right. But I can’t really put my faith in either camp – a least not beyond who to vote for in the next election. I put my faith in the Lord and if enough of us do that, the center will be Christian and it will hold.